A rift in Pine Island Glacier ice shelf, West Antarctica, photographed from the air during a NASA Operation IceBridge survey flight, Nov. 4, 2016. This is the second rift to form on the ice shelf in the last couple of years. The first led into the break off a huge iceberg in 2015. Credit: NASA/Nathan Kurtz. Last year, a huge 225-square-mile iceberg broke off the ever thinning Pine Island Glacier, in Antarctica. The iceberg served as a wake-up call for everyone, signaling the depreciating state of the glacier. “It’s generally accepted that it’s no longer a question of whether the West Antarctic Ice Sheet will melt, it’s a question of when,” said Ian Howat, associate professor of earth sciences at Ohio State. When Howat and colleagues analyzed satellite imagery in the intervening years before the iceberg broke off, they came across something unusual — shadows that were cast many miles inland, away from the warming waters of the Antarctic coast. 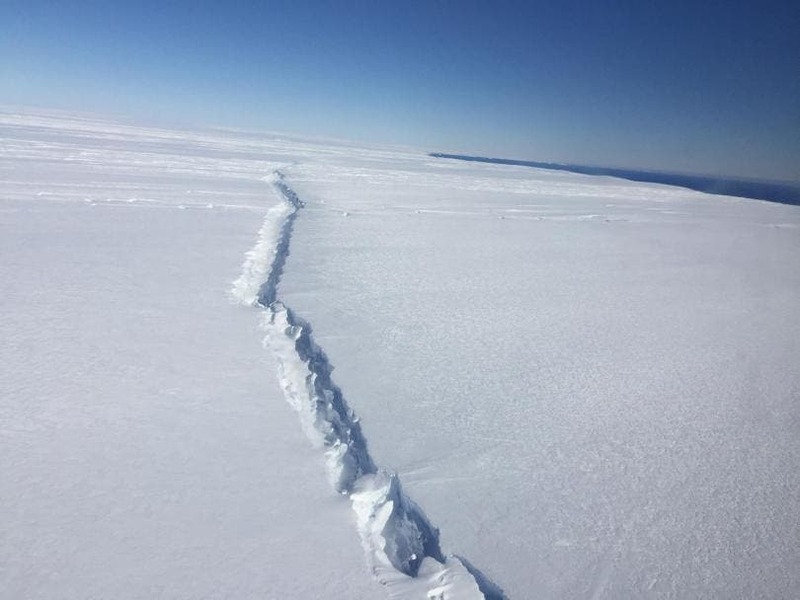 The rift which formed some 20 miles away from the base of the ice shelf steadily grew in size over two years until it weakened the ice beneath enough to cause it to collapse. “This kind of rifting behavior provides another mechanism for rapid retreat of these glaciers, adding to the probability that we may see significant collapse of West Antarctica in our lifetimes,” Howat said. This is the first time researchers have direct evidence of a deep subsurface rift opening within Antarctic ice. However, we know from earlier research that similar breakups occurring in the Greenland Ice Sheet are caused by corridors through which warm water seeps through the bedrock, melting the ice from beneath. Because the bottom of the West Antarctic Ice sheet is actually beneath sea level ocean water can intrude inland and escape detection. The research suggests new valleys forming inland in Antarctica’s ice sheets could be hints of ice melting far below and, consequently, impending collapse. Howat notes that there are many such features observed by previous surveys suggesting the state of melting in Antarctica could be far more accelerated than previously believed. Pine Island Glacier and its twin, the Thwaites Glacier, sit right beneath one of the most active ice flows on the continent. These act like cork bottles, keeping roughly 10 percent of the West Antarctic Ice Sheet from disintegrating and melting. The whole West Antarctic Ice Sheet itself is already considered unstable with some studies forecasting it will break down by 2100. If it melts, the ice sheet could raise global sea levels by 10 feet, putting large cities like New York or Miami under water. Overall, 150 million could be displaced. 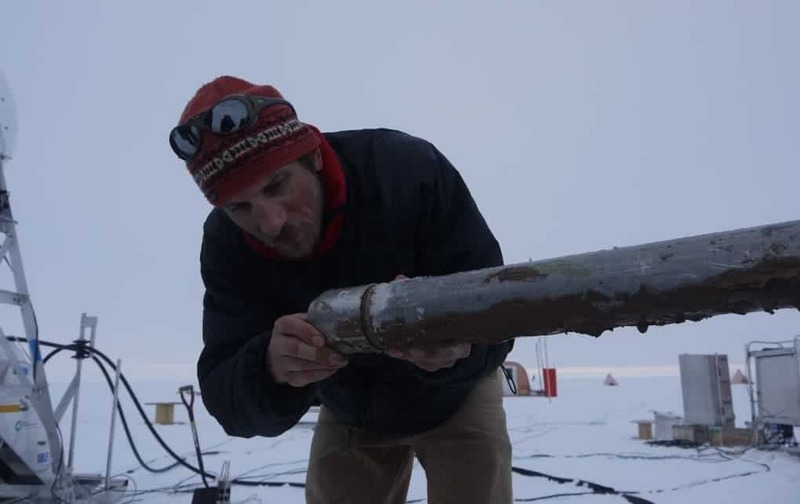 Another study published in Nature documented how researchers drilled holes in the Pine Island Glacier ice shelf during December 2012 and January 2013. The cores they extracted revealed the lithology and composition of sediments trapped beneath the ice while lead and plutonium isotopes tell us when the ice retreat began, and what the temperature was like. “What you find with the sediment cores is essentially a history of what has been going on at the bottom over the last couple of decades, because the sedimentation on the ocean floor is quite different once you have an ocean cavity from when you have ice actually touching the ground,” said University of Alaska, Fairbanks physics professor Martin Truffer for PBS. The analysis of the sediment cores extracted from Pine Island showed the grounding line of the glacier has retreated roughly 30 miles in the last 70 years due to a sudden pulse of warm water in 1945. Despite the temperature recovered soon after, returning to a cool state, the cavity formed behind the grounding line ridge only got bigger. Ice retreat and thinning since a warm pulse kicked off an irreversible melting in 1945. Credit: Smith et al., 2016/Nature. These results suggest sudden climate forcing can cause irreversible melting.